It is very important to me that I am efficient…always. I like to put things away in the most optimal order so I don’t backtrack. I often multitask to get things done faster. I like to be quick if I am shopping on a mission with a list. And last, but not least, when driving somewhere I like to get from A to B as efficiently as possible (while still staying safe of course). So when I decided to try Lowes Foods for the first time this week and it ended being a complete waste of my time (30 minutes to be exact)…I couldn’t help but be irritated! When I walked into Lowes Foods I already knew that I didn’t have all the time in the world (if I was going to be on time for the afternoon school bus). And I couldn’t easily find their organic produce – if they did in fact have any – so I decided to ask an employee. This individual didn’t even know if they had organic produce (?) and made an attempt to locate the produce manager over the phone after unsuccessfully searching for him on the floor. Maybe this was an isolated incident for their store, but it took (what felt like) 10 minutes to have my very simple question answered. And once I got the answer it was no wonder I didn’t see their “organic section” because it was TINY with only a few fruits and no vegetables! I immediately knew I was not going to try to shop my list there…and oh how I was wishing I was at Earth Fare even if it meant spending a few extra bucks in exchange for convenience. I wanted to be fair though and not bolt right away. So I at least did a spot check with one other simple thing on my list…a can of black beans. They do have an organic store brand and it did offer black beans, but it was packed full of sodium (of course) and no cheaper than a very low sodium can of organic beans from Earth Fare. So that was it for me. I did pick up a bag of slightly old (that sounds awful doesn’t it?) conventional limes for 50 cents. I figured it couldn’t hurt to spend 50 whole cents on it because I always seem to forget to buy limes when planning to make quesadillas or fajitas. So I thought it would help to have a dozen or so on hand just in case…but that was all I bought! I then got some much-needed relief by quickly and efficiently shopping my list at Earth Fare. Since figuring out that a few of our weekly staples are cheaper at Trader Joe’s I’ve simply been buying everything from Earth Fare except for those items (which includes cheese, nuts, yogurt, coffee, and now honey although TJ’s honey is not local). This does mean I have to go to two stores (aside from the farmer’s market and bread store), but I’ve been warming up to this new game plan. And it is actually very much working for me. So I am not sure what your expectations are with the remaining 40 days or so of this project, but don’t have any high hopes that I am going to keep trying new stores! Below are the “staples” that I picked up at Trader Joe’s. I hate that we ran out of coffee and espresso at the same time. They are both expensive items that provide very little sustenance, but they are oh so important during this cold cold weather that we’ve been having! I went to Earth Fare in Rock Hill last night. I about choked over the cost of things there, and ended up not getting as much as I would have liked. Even though Trader Joe’s and The Charlotte Farmer’s Market are both a bit of a hike for me (I live in the Lake Wylie, SC area) they are gonna be frequented by me. I like Harris Teeter too, and they are reasonably close to me. I would love to say it can all be found at one store, but like you I have to go to several stores in a months time it seems. BJ’s used to carry some organics I used, but past few times I’ve been there they don’t have those particular products anymore. I have never been to HillBilly Produce, and that one would be a hike for me, but it’s close to my husbands office so might be worth having him pick up stuff there occasionally. We are trying to eat healthy on a budget too! I’m in Charlotte too – and Earth Fare, farmers market, trader joes are the best bets with BJs and Harris Teeter as my stops for rounding out that last few things (we aren’t 100% real food eaters here yet. :) I don’t care for any of the other stores around here. Harris Teeter is overpriced but clean and they are sooo helpful at mine! I wanted to love the super walmart that just opened in Fort Mill, but my kids and I seem to have meltdowns every time we go. At a certain point you really do just have to find what works for you and stick with it because there are only so many hours in a week to think about shopping and budgeting. It can be so frustrating. I’m so for spending a few extra dollars (within reason) to save myself the headache and energy of finding deals. I couldn’t agree more about it not always being worth it to save a few bucks if it takes a lot of time (and causes headaches) to research the best deals! It is definitely not easy to figure out the best routine! I do like Matthews Farmer’s Market a lot too and it might take you just as long as going to the CLT one. I like it b/c it is a grower’s only market (100% local) where the Charlotte one is not. I think Earthfare is more expensive than other stores in some cases, but I also find that some items are cheaper there too. And not counting the farmer’s market they by far have the best organic produce in town. If you haven’t already you should sign up for their emails because they send you coupons which can make your shopping trip worth it! OH, and I’ve been to Lowes several times, and I was not that impressed either. I would rather go to Harris Teeter and they are closer to me anyway. Long way of saying, apples are sooo much cheaper at Trader Joe’s. At my TJ’s they are .59 each and .79 cents for organic. You paid $4.99 for 2! That’s crazy – pears are also cheaper there too, if in season. I love that you are becoming a Trader’s convert! 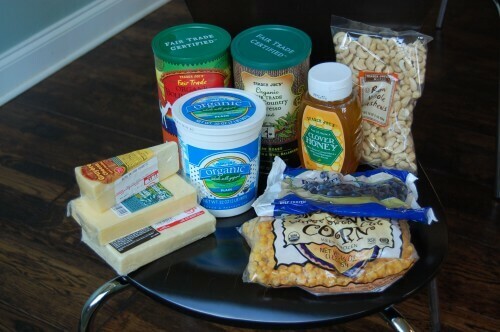 While not perfect, I love the organic options, nuts, cheeses, organice milk, whole grain pastas, etc. My local Trader’s in Minnesota also offers local-ish organic eggs (not sure what your policy is on eggs.) The prices (in my opinion) are great too! Yes, slowly but surely…I keep going back! I don’t like Lowes Food either. They are more expensive than Harris Teeter, yet the quality and selection is less than adequate, as you mentioned. I just don’t get that store at all. Farmers markets, Harris Teeter and Trader Joe’s are awesome!! I’m a Trader Joe’s convert. I just started shopping there about six months ago. Though I’m not a fan of Earth Fare, I get your comfort there. I feel that way about my Harris Teeter. I bet you’ll find you shop there less though, as you become more familiar with Trader Joe’s and even Harris Teeter. I’d probably shop Earth Fare (occasionally), if it weren’t so expensive and out of my way. I’ve heard they have a great cheese department. I just bought Trader Joe’s coffee for the first time. I haven’t tried it yet, but was so glad to see that it’s Fair Trade Certified!! I just hope it tastes good. There is just something to be said for the store you know the best…I bet if Earth Fare were closer you could be converted (for some things at least)!! :) Also, I agree TJ’s coffee is by far the cheapest organic version around. I agree…TJ’s is the best place for pantry items (only!). I really don’t believe that Earth Fare’s prices are higher than anywhere else. At times they are even cheaper than other places. The key is to know what you’re buying and to know how much things cost. I continue to shop at EF for the same reasons as you, but I don’t believe I’m spending that much more than anywhere else. I do have a Costco membership and shop there for organic milk, organic carrots, organic peanut butter, organic butter and a few other organic staples- there prices are HUGELY better than what I’ve seen anywhere else. For example- organic butter is sold in 2- 1 lb packages for $6.99. This works out to $3.50/lb MUCH better than I’ve seen elsewhere. I couldn’t agree more…I also find that Earth Fare is cheaper for some items which absolutely keeps me going back! And I seem to hear a lot of people talking about Costco, but I doubt we could justify becoming members. Just wanted to stick up for the Lowes employee… I work on the front end of a grocery store (bagging and maintenance) so I do not come into contact with our store’s inventory a lot, but I do have to go out “on the floor” to put damaged items away, clean up spills, etc. It’s always embarrassing when a customer asks if I know if we carry something or where it is… A lot of the time, I don’t, simply because that’s not in my job, but I feel bad for the customer. This may be the case with the employee you encountered. As always I appreciate the opposing argument! All I can say is….be glad you do have some options. Here in Oklahoma our farmer’s market closes for the fall/winter. We have Wal Mart and one OK owned store Homeland, which does offer a decent organic section. Other than that, it’s two very small local stores (my kids call them the hippie stores) which have wonderful selections of cheeses, gains and in season veggies….but they are expensive. I’ve just sucked it up and decided since we rarely to never eat out…that part of the food budget pays the extra for fresh, wholesome stuff from the locally owned folks. I also discovered a coop, so I’ll be trying that this month. But there is NO Trader Joes, Earth Fare or even a Whole Foods to choose from. And Lowes around here is a hardware store!! Yes, you are right…we are very lucky here in Charlotte with many great options for food (including restaurants too)!! Do you plan on trying to stock up seasonally? This next summer would you try to stock up and freeze your own items locally so you don’t have to shop for specific things in the winter? I would love to do that if I could on such a tight budget! I seem to have a lot of trouble “stocking up” on such a small weekly food budget…it is definitely something I need to work on! I also can’t stand Lowe’s. I do the Trader Joes/Harris Teeter/Earthfare triangle. I wish I could get everything at one store, but unfortunately, that is not possible. I also go to the occasional farmer’s market as well. PS Trader Joe’s sells bags of organic apples for around $2.50 for the whole bag! Good tip! We are on an apple kick around here! I have to say that you’ve really done a great job at trying new places and figuring out what works for you. Just because some people can do ALL of their shopping at Trader Joe’s, that doesn’t make it idea for your own desires and those are what should count, really. I do agree that I have to split my shopping between several stores in order to get the best deals/options, but if I cared less about how much I spend, I’d do it all at Whole Foods and be done with it. I’ve never had guyere, and it usually shows up in recipes that won’t really work for me. What do you use it for? If you want to save money and control the amount of sodium in beans, you should try prepping dried beans. I wrote an article on my blog about how to make them convenient, like black beans, so you don’t have to soak/boil every time you want to use them. Milehimama: Guyere cheese is very simliar in taste to swiss cheese. Try it sometimes — it’s really delicious. Gruyere is similar to swiss and really good in fondue as well as egg dishes (like omelets or quiche). I don’t really like swiss type cheeses by themselves, but they can really be great mixed in with a dish. If you think the flavor is too strong you can always cut it with another cheese. Also, thanks for the tips about dried beans! We have an EF, TJ, and WF (I am in GA) – but all a good distance from me – about an hour round trip. With rising gas prices, I just can’t justify the drive anymore. I shop mainly at Publix now, sometimes Ingles. I hear a lot of people say great things about Publix! Plus they do have a decent whole-wheat bread in the bakery…which is a big plus! thank you so much for providing valuable info about the topic. I am a fan to your website. Keep up monetary management job. I go to Tom Leonard’s Farmer’s Market (chain?) & Trader Joe’s mostly, but we have a “triangle” that also includes Whole Foods in Short Pump, Richmond, VA. 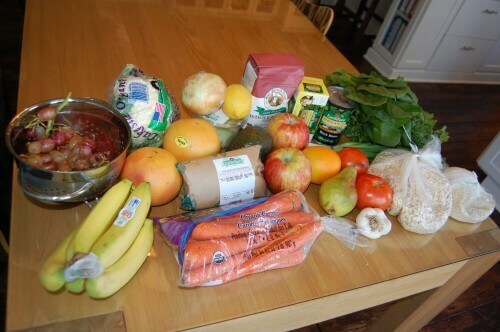 So I love that – For some reason I can’t find bulk items any where other than whole foods around town? :) Thanks so much for this blog, we’ve been following for a few months now and my whole family is benefiting! Thanks for all of the great info on your website! What kind of cheese do you typically buy (brand?, is it organic? is it from cheese dept at Earth Fare or is it prepackaged like Organic Valley or Horizon)? Also wondered what brand of organic EVOO you buy if you still use olive oil. I love Earth Fare too! Hi there! I’m new to you blog (and seriously, I love it, I’ve been making radical changes to our diet in the last few months, so your blog is a wonderful resource!) so this is a question that may already have been answered – I’m curious why you keep getting your honeydew melon pre-prepared. Every time I’ve price compared, it’s a LOT less expensive to buy a whole melon, and cut it yourself. Hi – These budget posts are from 2 years ago, but at our store it usually only costs $1 or $2 to buy a little bucket of the melon cut up like that and since I had a limit of what I could spend overall I was more worried about total cost vs. cost per pound. Love your blog, thanks for all that you do. What is the difference between organic chicken and all natural chicken? I have a question, I keep reading you drink your “mocha” with a shot of espresso in it and cream. Do you have like a machine that makes it for you? I’m just curious about your morning “coffee” because I’m not much of a “coffee” drinker myself but with a one year old waking up at the crack of dawn would like to try espresso! thank you for sharing your blog – I’m loving reading it and am inspired now too to go “no more processed foods”. Its ridiculous the amount of processed foods out there. I’ve already shared your blog with a friend of mine because you have me smiling at your experiences and I feel your struggle with budgeting! Have you ever looked into getting a Costco membership? They have a ton of cheap bulk organic staples. For instance my chia seeds,coconut oil,tomato sauce and quinoa are all from there and all organic. They also have organic beef,cheese,cream,butter, and chicken at low bulk prices. Do you have a online store recommendation?